DETROIT, Mich. (March 20, 2019) - On Wednesday afternoon, the Official Commemorative Poster of the 2019 Chevrolet Detroit Grand Prix presented by Lear was selected from five designs created by the talented students at Detroit's College for Creative Studies (CCS). The entry created by CCS student Allie Fedak was chosen as the winning poster design following a comprehensive judging process on the CCS campus. The design will be celebrated and featured during the upcoming Chevrolet Detroit Grand Prix presented by Lear - the 30th Grand Prix in Detroit's history - May 31-June 2 on Belle Isle. The 2019 design competition marked the seventh consecutive year that the Grand Prix has worked with CCS and its students to create the official poster for the annual summer celebration in the Motor City. It also represented the second consecutive year that a fan vote was factored into the selection process, along with the seven-person judging panel that evaluated each of the final designs. All five final entries of the poster competition were shared on the Grand Prix social media channels on Tuesday and the fans' votes were included in the winning entry selection. "The beauty of what these students at CCS create every year in this competition is amazing," said Bud Denker, Chairman of the Chevrolet Detroit Grand Prix presented by Lear. "We had five great designs we saw today and it was hard to choose one of them, but Ally is our winner and she is going to be a great ambassador with her excitement and enthusiasm. She brings that with her poster design as well, which is all about celebration and the spirit of the Grand Prix." The winning poster design created by Fedak, a junior at CCS who is from Canton, Mich., captures the fun and excitement of Detroit's annual motorsports festival. 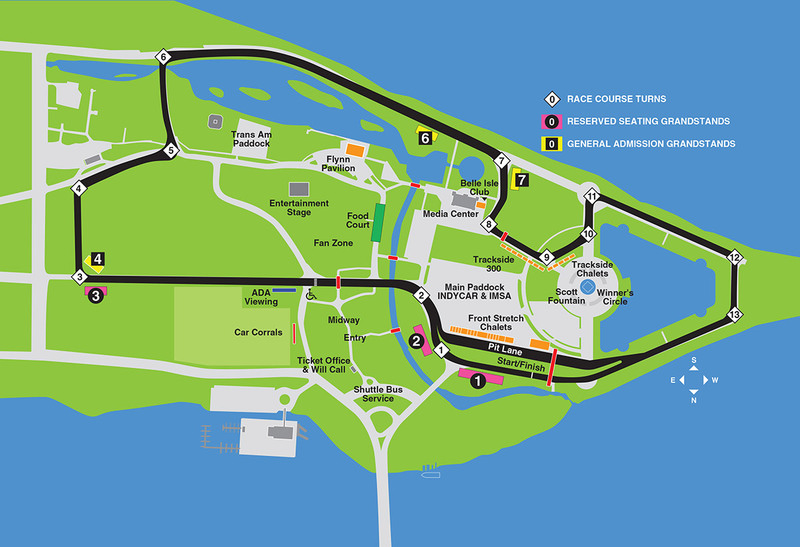 The design features an amalgamation of the various cars that have raced at the Grand Prix over the years in front of the iconic Scott Fountain on Belle Isle as drivers celebrate with confetti and champagne flowing around them. "I don't know how to put into words what winning this competition means," said Fedak, who shouted for joy once she was announced as the winner. "I wanted to create the most ideal celebration of the Grand Prix possible with the car crossing the finish line and also in the Winner's Circle with everyone holding up their trophies triumphantly with the historic Scott Fountain restored and shooting out water and looking absolutely beautiful. " A total of seven judges participated on site at CCS Wednesday as they listened to all five finalists describe the vision and process behind their creations. Judges included Denker; General Motors Industrial Design Manager, Stuart Cooper; Lear Corporation Global Design Manager, Color & Materials, Jeanette Puig-Pey; WDIV-TV Channel 4 sports reporter/anchor Jamie Edmonds; Detroit News Editorial Cartoonist and Auto Critic, Henry Payne; Detroit Free Press Assistant Sports Editor, Ryan Ford and Dean of Undergraduate Studies at CCS, Vince Carducci. The five finalists in the competition are students in the CCS Digital Illustration class taught by instructor Brian Kotulis, who introduced each student and provided an overview of the competition at Wednesday's judging. Some of the top illustration and design students in the country study at CCS, a private art and design college in Midtown Detroit, and the Grand Prix proudly provides the opportunity each spring for the students' talent to shine in the annual poster design competition, that is part of the actual class curriculum. The students gain real-world experience in working with an actual "client" to create a professional look and feel for the finished creation. The competition gives the students a chance to create a unique piece of art while keeping alive the Grand Prix tradition of commemorative posters dating back to the very first Detroit Grand Prix in 1982. CCS student Rose Valerius finished second in the competition while the design created by Haley Smith was selected as the third-place entry. The finished poster design created by Fedak will be officially unveiled on Tuesday, April 30 during the annual Grand Prix media lunch with the Detroit Sports Media organization, featuring former NTT IndyCar Series champion Josef Newgarden of Team Penske. The 2019 poster will available for purchase beginning that day through the event's official web site, www.DetroitGP.com.